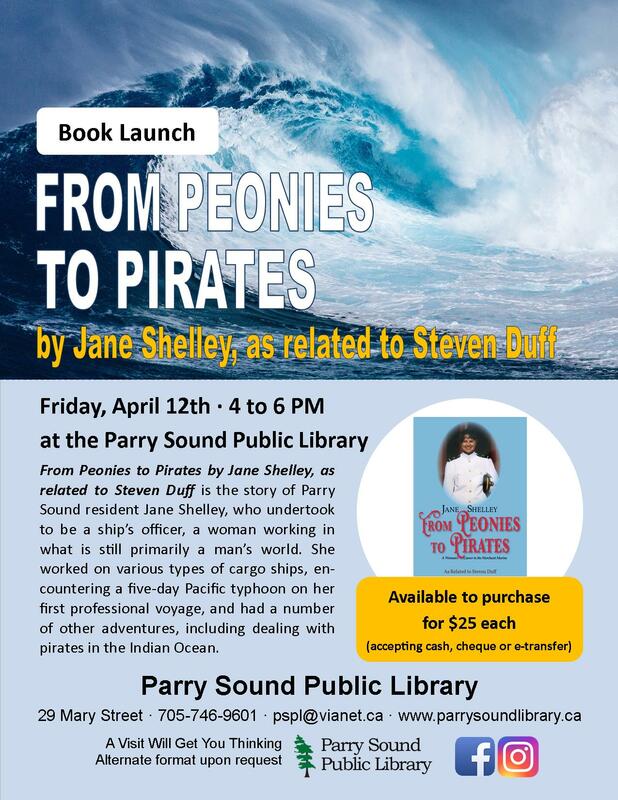 Join us at the Parry Sound Public Library on Friday, April 12th from 4 to 6 PM for the launch of Jane Shelley and Steven Duff’s new book – From Peonies to Pirates. A story of Parry Sound resident Jane Shelley’s adventures as a ship’s officer – including working on cargo ships, encountering a five-day Pacific typhoon, dealing with pirates in the Indian Ocean and more! From Peonies to Pirates will be available for purchase at the event (accepting cash, cheque or e-transfer). For more information – go to our website parrysoundlibrary.ca or follow us on Facebook!